In addition to Cinnamon themes, Linux Mint also allows you to change its Window and GTK+ theme. Much like installing a Cinnamon theme, it is simple and easy to do. Although there are a few tweaks you may have to do to get your desired theme to be universal across multiple accounts (especially the root account). Firstly, head over to Gnome-Look and take a look under the "GTK 3.x" section. If you are using a relatively new Linux distribution, chances are you are using GTK 3.x. Once you have downloaded a theme, uncompress it and open up your home directory. In the Other Settings tab, you should see "Window Theme" and "GTK+ theme"
Although the theme applies successfully, you may have noticed that when you run applications as root, you lose your current theme. The result is an ugly, bland, Windows 98 type user interface. To fix this abnormality simple follow these steps to extend your current theme into 'root' territory. After that, you may have to restart your computer for changes to take affect. You can also try logging out and in again but I personally have not tried it. 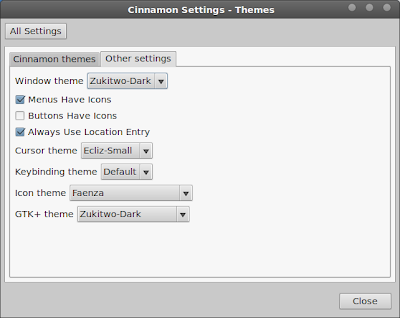 So there you have it, a simple way of changing your Linux Mint's Window and GTK+ theme. Next time I will be talking about how to change your system's icon theme. Until then, happy customizing! The Humble Bundle is back in it's 5th reincarnation. As per usual, you pay what you want for Psychonauts, LIMBO, Amnesia: The Dark Descent, and Superbrothers: Sword & Sworcery EP. If you choose to pay more than the average price, you will also receive Bastion! Each game comes with its soundtrack in both lossless (FLAC) and MP3 formats. Each of these DRM-free games works on Mac, Windows, and Linux, and can optionally be redeemed on Steam if you choose more than $1. Bundle buyers can also benefit the Child's Play Charity and the Electronic Frontier Foundation, non-profits doing excellent work in the name of gamers worldwide. The deal will only be live for 2 weeks, so click here to pick up your Humble Indie Bundle V before time runs out!